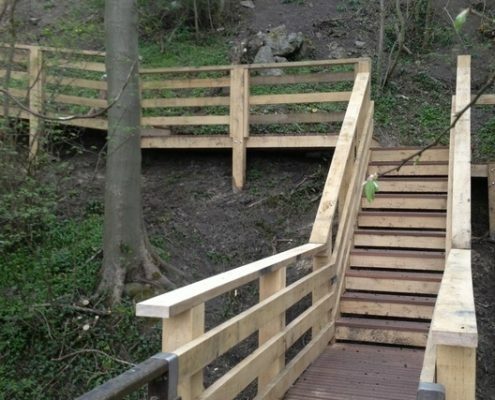 A difficult challenge lay ahead when boardwalk installation contractor, Conservefor Ltd, was appointed by Lancashire County Council to design and build a 32 metre section of hardwood boardwalk linking a new section of public footpath to an existing timber bridge. The proposed line of the new boardwalk crossed a steep wooded banking and to make the project more difficult the only access onto the site was via a very steep set of concrete steps. The new route was required because the original footpath had partly clasped into a stream and was unsafe and unusable. Having produced a design, which was approved by Lancashire County Council Highways Engineers, the team began the task of transporting the materials to site. Slowly but safely over seven tonnes of hard wood was manually lifted, carried and delivered to site ready for construction of the new boardwalk. To minimise removal of vegetation and to enable the boardwalk to sit aesthetically within the woodland environment the line was altered slightly from the original plan and once this was agreed construction began. This first task was to manual dig the holes for the large oak posts which would hold the sub frame and carry the handrails. 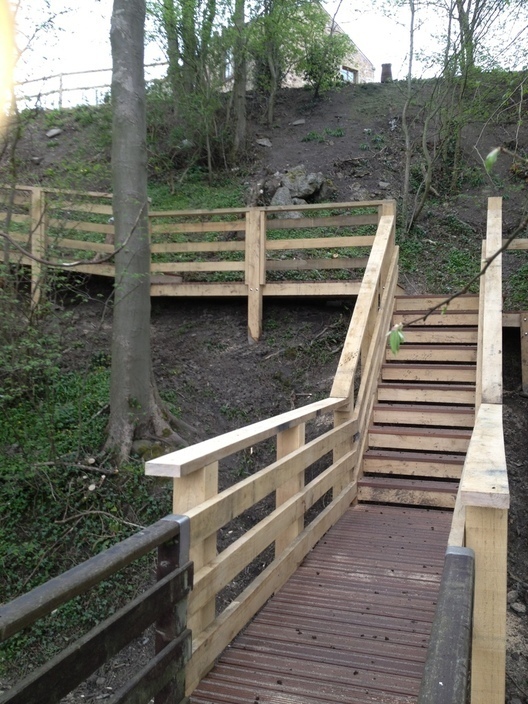 Our team then constructed the green oak frames which were bolted to the posts; they built a small set of steps linking the bridge to the boardwalk and then installed the decking boards which were screwed in place before the handrails were finally added. Once all the major construction work had been completed the handrails were chamfered, sanded and the site left safe and tidy.